1. No Risk, 30-day 100% money-back guarantee! Put your mind at ease. If you don’t like it, send it back unworn and unaltered for a 100% refund! We will even send you a free, fully insured return shipping label. 2. We only use high quality, conflict free diamonds. 4. FREE SHIPPING & FREE RETURNS. INFORMATION about SHIPPING, WARRANTY, INSURANCE, PAYMENT OPTIONS, etc. can be found under the same link. • WE CAN provide a different size diamond according to your price needs. • This ring can have a round or square shaped center diamond. Contact us if you’re interested in a different shape. IF THIS IS NOT THE RING FOR YOU, WE CAN CUSTOM MAKE ALMOST ANY RING! JUST EMAIL US A PICTURE FOR A QUOTE! THIS RING SHIPS OUT WITHIN 2 WEEKS of purchase because it will be custom made after you order. IF YOU NEED IT SOONER, please contact us BEFORE purchase about doing a RUSH order. 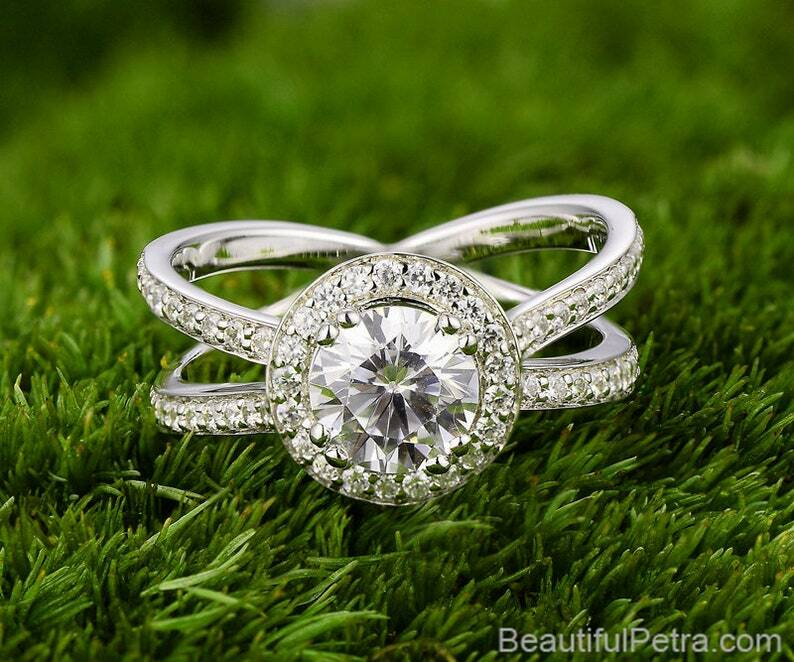 We are ALWAYS giving away diamonds, so like “Beautiful Petra" on Facebook and enter the current contest! I received the ring sooner than expected and it is everything I hoped for. I plan to buy again from Petra. Highly recommend. The wedding band matches my engagement ring perfectly. Petra gives excellent customer service and makes sure you are very happy with your purchase. I can't stop staring at my set. It really sparkles and shines in the light. I have gotten many compliments already. Thank you Petra! A thousand hugs to you!!! The band is beautiful and the service was great as usual! If you find that other companies, stores or sellers are coping our rings, using our name or using our pics, please feel free to send us an email. NO other company is authorized to use our name or sell our designs. 1. PAYPAL. (You can use your credit card, debit card or bank account though paypal). 2. CERTIFIED BANK CHECKS or BANK WIRE. (This will save you 1.9% off the advertised price). Please contact us by phone (704) 796 4346 or by email Orders [!at] BeautifulPetra.com for payment instructions. *Your item will be shipped once payment is confirmed/cleared and your item is ready. It will be shipped with tracking, insurance and signature confirmation. Bill Me Later is another way for qualified buyers with a PayPal account to purchase items now and get the bill later without using a credit card. A: Payment plans: Make up to 30 payments in a 6 month period. The ring will be made when it has been half paid for and will be shipped out when it is 100% paid off. When you get the ring, you have a 30 day return policy. You can send it back, UNWORN and UNALTERED and get 100% of your money refunded. 30 day RETURN POLICY. NO QUESTIONS ASKED! IF YOU WISH TO DO A RETURN, WE WILL SEND YOU A FREE FULLY INSURED SHIPPING LABEL to send the item back. Free return labels are for in the USA. We have built our reputation on treating customers as we wish to be treated! Our reputation is precious to us, so before leaving any less than favorable comments, contact us and allow us to demonstrate how determined we are to satisfy each and every customer! For Jewelry over $250, we use FedEx, UPS or USPS with signature required. Please be sure someone over 18 years old is available to sign for your package. Your item will be shipped once payment is confirmed/cleared and your item is ready. It will be shipped with tracking, insurance and signature confirmation. FOR OVERSEAS BUYERS: Any custom's duties, taxes and VAT are the buyer's responsibility. Please contact customs in your country and calculate the duties and taxes that you will be charged by your country BEFORE purchasing a ring. LOCATION: We DO NOT have a physical store/showroom. Our rings are made to order AFTER we receive cleared payment. Beautiful Petra LLC is NOT affiliated with any other companies. Other companies may market our products, use our Business names and pictures, BUT they are NOT authorized to do so. Please contact us at Petra@beautifulpetra.com if you find another company selling our products. How long before I get my ring? Each ring ships within APPROX 2-4 WEEKS of purchase because it will be custom made for you AFTER you place an order. IF YOU NEED IT SOONER, please contact us BEFORE purchase about doing a RUSH order. We CAN accommodate most rush orders. Feel free to text, call or email about rush orders. Make up to 30 payments in a 6 month period. The ring will be made when it has been half paid for and will be shipped out when it is 100% paid off. When you get the ring, you have a 30 day return policy. You can send it send it back, UNWORN and UNALTERED and get 100% of your money refunded. We will even send you a FREE shipping label to send the ring back to us for a FULL refund. There is a company called "bill me later" that customers can get financing from/through. It is a paypal owned company. You can Google "BILLMELATER" for the details. 2. CERTIFIED BANK CHECKS or BANK WIRE. (This will save you 1.9% off the advertised price). Please contact us by phone (704) 796 4346 or by email Orders@BeautifulPetra.com for payment instructions. Does your company offer Refunds and Exchanges? IF FOR ANY REASON, you are not 100% delighted with your purchase, please note that our simple, "NO HASSLE", NO QUESTIONS ASKED 30 day RETURN POLICY located in each listing. IF YOU WISH TO DO A RETURN, WE WILL SEND YOU A FREE FULLY INSURED SHIPPING LABEL to ship the item/s back. The return label is for residences in the USA.